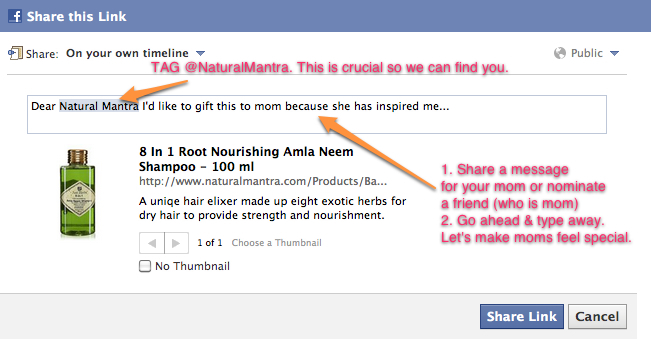 How to participate in the ‘My Message For Mom’ Contest? With just a little over a week left for Mother’s Day, we’re all searching for the perfect gift for our mom. Natural Mantra offers a variety of non-toxic, high quality gifting options for mom, from bath & body products to home decor, green cleaning, delicious natural and organic food products and a lot more. Moms make our lives SO special, standing beside us every step or the way. This time we want to make Mother’s Day truly special for every mom we know. To make this possible, we’re providing a platform for everyone to share a message for their moms (or a mom from your friend’s circle). Loving the thought already? Read on to know how you can participate. This contest is open to our Facebook fans only. To participate you must “Like” the page first. Follow these 3 easy steps to enter the contest. 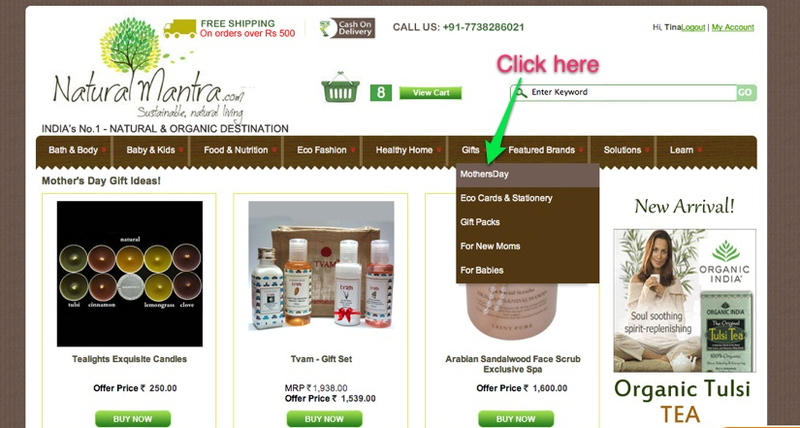 Click the “Gifts” Menu and select “MothersDay” to go to the page from where you can select the product of your choice. 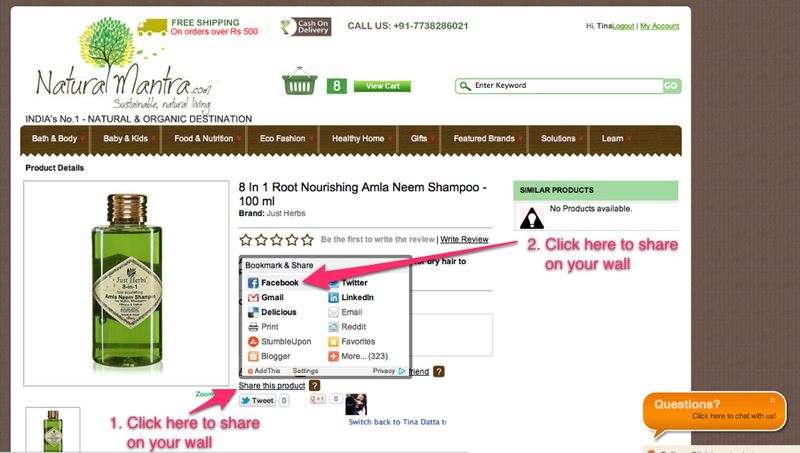 Step 2: As you hover on the “Share this product” button a menu will pop up. Select “Facebook” and you are ready to share on your profile. Step 3: TAG us so we can find you. This is crucial. Add a message and click ‘Share link’. That’s it! Our team will go through the nominations and select 2 winners basis the most creative entry we received. Share more and boost your chances: This contest is about the celebration of Motherhood. Reach out to all the moms you know… maybe a friend, your sister, a neighbour, a co-worker, or someone who is a Mom-to-Be? Go ahead nominate them right away. Select a gift and take this chance to tell them how special they are. Go ahead and tag them. The more you share the more you increase your chances to win. More importantly you’re taking the step to make their day special instantly. For the fine print. Please click to read the rules & regulations. Contest ends May 8th, 2012 midnight. This contest is open to the residents of India, who are registered fans of Natural Mantra on Facebook. In our fast paced lives, a sustainable lifestyle shouldn’t be a struggle, but it sometimes is. Our online e-commerce provides the largest selection of natural, organic and eco-friendly products in India making it accessible and affordable to all. At NaturalMantra.com you can choose from a wide selection of safe, healthy non-toxic products, all at one place delivered to your door! Not every product makes it to NaturalMantra.com but the ones who do make it through our selection criteria. Categories: Sustainable Living | Tags: Green Gifts, mothers day gifts, natural, organic products india | Permalink.